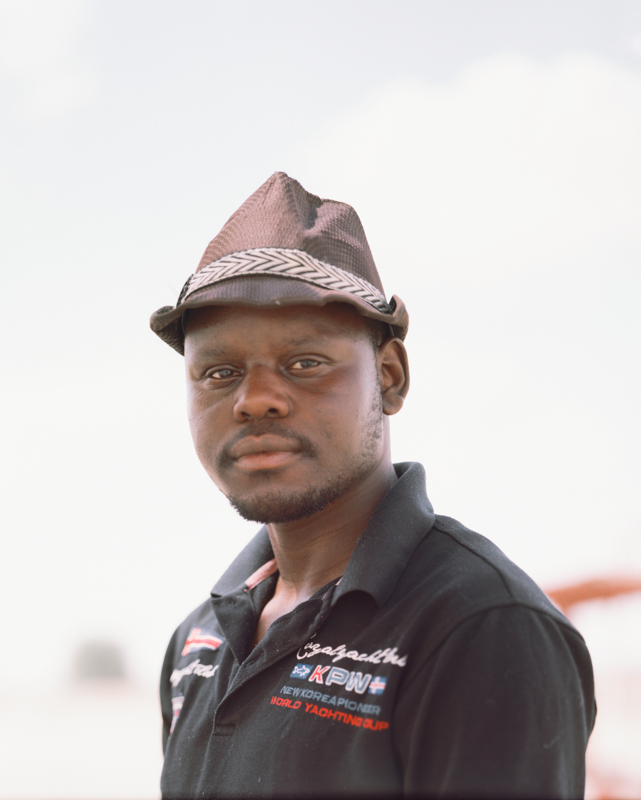 A portrait series of African migrants that are held in detention centre Holot in Israel, shot with a large-format camera in an open air ‘studio’ in the Negev desert. The intention of the project is to humanize and individualize the refugees, which the Israeli government has labelled “infiltrators” and to shine a light on undemocratic and inhumane dealings with migrants that are also taking root as political practises in Europe. 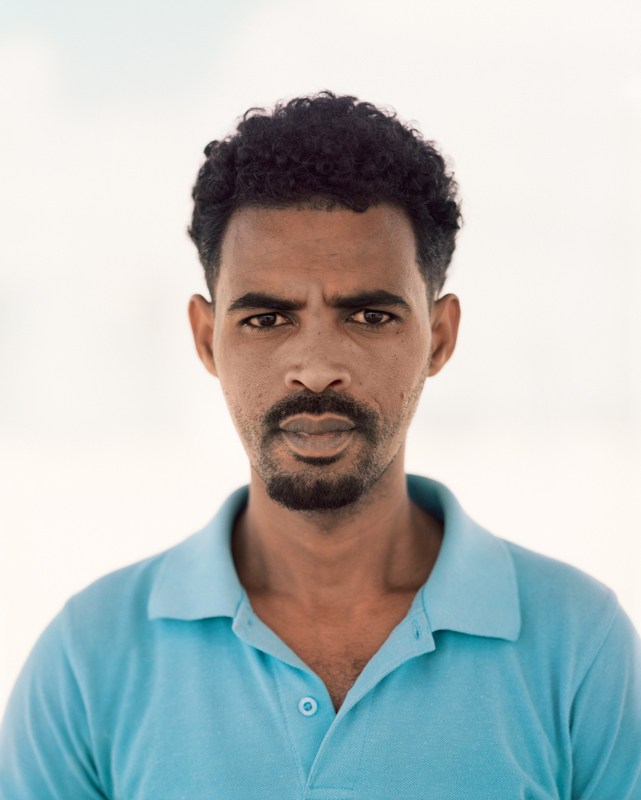 Abraham fled alone from Eritrea and has been in Israel since 2011. In Egypt, he was captured and tortured in Sinai - beaten with iron bars, especially on his legs - to force his family to ransom. After a week, his brother brought 5000 dollars together, and Abraham was released. It took him 3 hours hobbling seriously injured to the Israeli border through the night. He first came to Israel hospital, then to Saharonim prison. Now he has been in the Holot Detention Center for 5 months. Bereket is an agricultural scientist. Since 2012 he has been in Israel, since October 2016 in Holot Detention Center. On his flight from Eritrea, he was kidnapped in Sinai, and was only released for a high ransom after 28 days. At the Israeli border, he and other refugees were fired at by Egyptian soldiers. Bereket is an activist in the Eritrean resistance movement. "I was in the opposition in Eritrea, for my rights, for my freedom, for justice, they did not let me live my life." After giving a TV interview two months ago, his brother in Eritrea was kidnapped by the police; no one has ever heard of him again. Tsegay Bahta, a water and soil conservation specialist, fled 2011 after 7 years in the national labor force from Eritrea. He was kidnapped in Egypt and released for $ 3400 ransom. His wife, who fled after him, was enslaved by ISIS for a year in Libya until she was able to escape from captivity. Her four children are still in Eritrea with the grandparents. 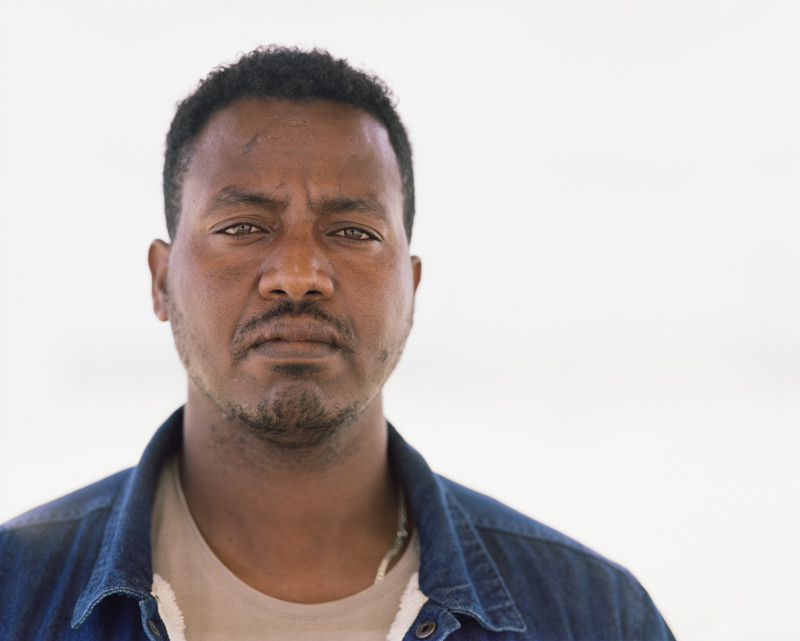 In Israel, Tsegay worked on the construction until he came to the Holot Detention Center. "I need protection here - but if I could safely live with my family at home, I would not stay a minute. One day I hope to see my family again." Andit fled at the age of 16. The first flight into Sudan failed; the Eritrean government took him back and threw him into prison. "I'd rather die than stay there - so I took the risk. The next time they find me, it will be life-long." On the second flight, he was sold by Sudanese soldiers to Eritreans who let him go against ransom. Then he was blackmailed by Bedouins in Sinai. In April 2011 he was refused entry with 34 other people at the Israeli border and sent back. The Egyptian border guards fired - only 17 of them survived and were finally let into Israel. Now he has been in the detention camp for 7 months. Andit has been in Israel for 6 years and would like to become a photographer. Adam was born in 1987 in South Korofan, Sudan, in the Nuba Mountains. In 1997 he came to Khartoum with his father to study Arabic. At the age of 16 he finished school. "If I had become a Muslim, I would have a passport, but I did not want to." He was committed to 3 years of military service. After a year he was to go to the war against the South - against "his own people". When he refused, they threatened to kill him. He went to jail. There he was tortured - he has severe burns on the body and scars of shackles and beatings. In 2005, he was released during the inter-North-South Sudan peace exchange. He stayed in Khartoum and trained as an electrician. Again he was exposed to the pressure to become a Muslim. In 2012 he was arrested again, this time for 6 months. Then he fled. After 5 years of work in Israel, he has been in Holot for 3 months now. However, the Israelis have told him that he will never get a residence permit in life because South Sudan is "now independent". But he has no contacts abroad that could help him leave the country. "This country is religious, that is not good. People can be religious, but a country? This is like Saudi Arabia. " During the genocide in Darfur - Dolosa was 13 years old - his village Malian was attacked and destroyed by Arab militia, the Janjawid. He was the only survivor and seriously injured. His mother found him and escaped to a refugee camp with him and his sister who had lost her child on the run. In 2005, he went to Khartoum alone, where he worked with 2 friends as a shoe cleaner, and began to learn English. The Sudanese government persecutes English students because they are suspected of being rebels - the northern Sudan is Arabic-speaking. In 2011 he was imprisoned for 6 months - after which he decided to flee. At the age of 23 he reached Israel. "We are still not free. We should have rights and be recognized as asylum seekers. What we need is safety, health, school education. Then we can go back to build our country. "His nickname is Cambal - the energetic one. Mtseamlak fled Eritrea because he was in military service and was afraid for his life. Since he could not raise the money for smugglers, he was initially in Sudan for 10 months. He made it to Israel in 2012 but came to Saharonim prison in the Negev desert for 1½ years. Then he worked near Gaza, and has been in Holot for 5 months now. His wife and children are still in Eritrea. Mtseamlak has not been able to cope with the flight and the prison: "I call for help, and do not know why it takes so long." After the 10th class, Ramzi was to be recruited for military service. He knew that he would have no future in Eritrea and fled to Ethiopia. From there he tried several times to get to Sudan. Finally, he managed to get to Sinai through the desert. He won’t talk about the time there. "There are terrible things there that you see with your own eyes." Since 2010 he is in Israel. He thought "Israel is a peaceful, stable country. You could be there as you are and live the way you imagine. "Then he was sent to the detention center 5 months ago. "I have learned the language and culture and have never been in trouble." Around 45.000 Africans who fled war in South Sudan, genocide in Darfur or military dictatorship in Eritrea and made the perilous journey through Egypt and the Sinai Peninsula are seeking refuge in Israel. But Israel has not offered asylum to more than a few persons from Sudan or Eritrea. Instead, under the “Anti-Infiltration Law”, all male refugees are eventually summoned to stay in detention centres and pressured to self-deport. More than 3,000 men are now in Holot in the southern Negev desert, in an isolated area where there's little to do and nowhere to go. The government calls Holot an "open-stay centre"; detainees are allowed to wander the desert but if they miss the check-ins or don’t remain overnight, they are sent to neighbouring Saharonim prison. Holot is a sort of no man’s land, intended to break the detainee’s will and accept voluntary deportation. After 12 months in confinement, the African migrants have to make a choice - between infinite imprisonment in Israel, the return to their country of origin or leaving to a third country, like Uganda or Rwanda. There's a joke among the migrants that the $3,500 offered as an incentive for departure is just enough to get to Europe. The cruel strategy applied by Israel is also in the making or in practise in Europe as more and more countries, even dictatorships, are declared “safe” for refugees to be deported to in exchange for favourable deals. In a bid to prevent political crisis and by bypassing the UN Refugee Convention, governments have started dumping ‘undesired’ people to places where they are not wanted, illegal or in danger. Refugees fleeing from war and oppression find themselves exposed to insecurity and exploitation instead of finding safety and security. Israel’s dealings with migrants showcase what a refugee policy based on foreclosure looks like.